The Apprenticeships exemplar team are now heading for public beta assessment on 12th November 2014. For those new to the Apprenticeships exemplar Mike Bracken set the scene in a blogpost after visiting us in September, which outlines what we are looking to achieve. The team continue to juggle morning stand-ups, sprint planning, retrospectives, and show and tells; but the important thing is that feedback so far from users has been very positive. The team have been preparing hard for the assessment, spending time each day ensuring that we are able to evidence each element of the Digital by Default Service Standard. Mock assessments have helped. We had one with our CDO Tim Clayton, and 3 with GDS colleagues and subject matter experts. These are to really ensure we are ready to be assessed. It's exciting times. As well as project boards, designing service operating models, assisted digital, and digital transformation work with the other Agency Heads of Digital Services, we have another run through mock assessment with our CDO tomorrow. Let’s hope it goes as well as it will do in a weeks' time. I'm looking forward to the service going into public beta now, and intend to expose users to the new service gradually during public beta. We are expecting the service to go into public beta at the end of November 2014. Unlike many other services, channel shift is about switching users from the current service to the new service not from paper to online. 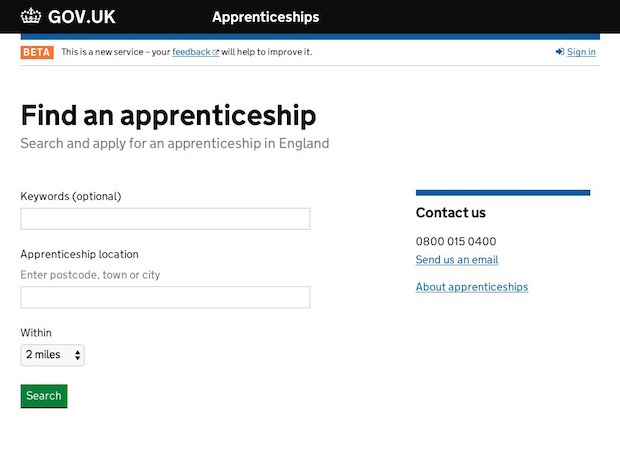 From day one we will have links from three places the current apprenticeship vacancy system, the apprenticeships website (until this is transitioned to GOV.UK later this year) and GOV.UK itself. As we go through public beta we will closely review the volume of users and how the service is coping. Only then will we expose more users to the site. We are expecting traffic figures initially to be around 20% of the traffic that goes to the current apprenticeship vacancy system. Over the period of public beta we expect those figure to increase to around 75% of the current traffic. This means an estimated 75,000 users will use the new service over the course of public beta. By gradually onboarding users we will gain valuable feedback from users and test our agile capabilities to continuously improve. It will also test our business processes. Keep in touch. Sign up to email updates from this blog or subscribe to the feed.